That brings us to the more pressing questions: how much cardio, and what kinds? In a recently published case study of a natural bodybuilder, the authors reported that he did five 40-minute cardio sessions a week in the final month of his contest prep. He did well: in 14 weeks, he cut his body fat in half (from 14 to 7.2%) and finished seventh out of 19 entrants. But he also lost 11 pounds of muscle, which was 43% of his total weight loss, and higher than expected. The researchers wondered if excessive cardio created too big a calorie deficit, noting that the less body fat you have, the less there is to lose. - Strength and endurance exercise develop different fibres in different ways, only one of which will look impressive on the beach. Both types of exercise drain glycogen from muscles, potentially leaving a lifter with limited fuel for training when he’s simultaneously cutting calories. - You won’t be surprised to learn that the interference effect is most pronounced in the muscles you force to do double duty. Running especially has been shown to affect strength and size in your lower body, due to the fact that running induces more muscle damage. Walking and cycling are safer choices. Which brings us to intensity. We know high-intensity interval training causes less interference with strength training. But that’s because it’s so similar to strength training, which, as Finn points out, “is itself a form of intense intermittent exercise,” if you’re doing it right. Intense exercise requires recovery. Two forms of intense exercise only increase that requirement, especially when you’re also dieting down to reach single-digit body fat. “It can often lead to you feeling burned out, tired, and irritable,” Finn says. 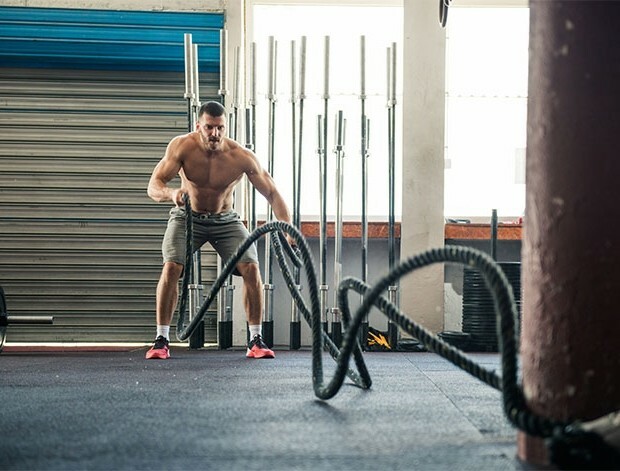 “Three to five hours of lower-intensity cardio, spread across four to five weekly sessions, is usually enough to get the job done,” Finn says. But if you can do less and still get the results you want, you should. Now we get to perhaps the biggest irony of physique training: those abs you see on the leanest guys may have been started in the gym. They may have been enhanced in the kitchen, mostly by staying out of it. But they were finished on the treadmill. Which could be the least motivational cliché of all time. Lou Schuler is an award-winning journalist and contributing editor toMen’s Health. Check out his new book Strong: Nine Workout Programs for Women to Burn Fat, Boost Metabolism, and Build Strength for Life, with coauthor Alwyn Cosgrove.